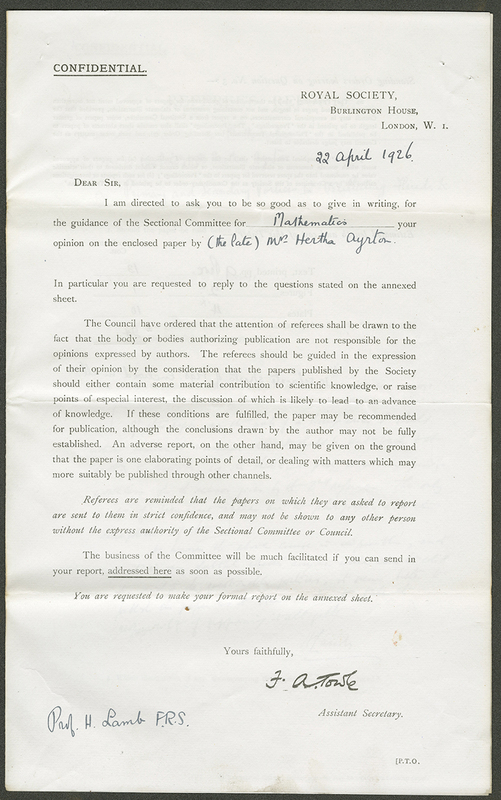 On 13 June 1963, the president of the Royal Society Howard Florey presented a ‘Code for the Publication of New Scientific Journals’ to a meeting of officers representing 55 British scientific societies. In the light of subsequent developments in the management and ownership of scientific journals, the Code’s insistence upon scholarly control of academic journals is notable. It was written at a time when the growing involvement of commercial publishers in academic publishing was becoming visible. It is not yet entirely clear to us what the reaction or effect of this proposed Code was. The meeting at which it was first discussed was supposed to be the first in an annual series that would create ‘more contact between the many scientific societies’. The fact that the series started with ‘Scientific Publications’ is a striking statement of the concern felt about publishing in the early 1960s. To stimulate discussion, the Royal Society offered tea and coffee, and circulated advance copies of Frank Morley’s pamphlet Self-Help for Learned Societies (Nuffield Foundation, 1963). It’s a fascinating read, grounded in the fear that learned society publishing was near to extinction; and full of advice on how societies could reform their practical publishing operations (mostly through focusing on increasing their sales income). The problem with both the Code and the Self-Help advice is that they enabled societies to reform their own practices, but had no power to affect what commercial publishers (e.g. Pergamon, Blackwell) were doing. The Code was written on the assumption that ideas for new journals would emerge from the scholarly community, and that a group of academics would then need to find a way to work with a publisher, while retaining ownership. In fact, plenty of new journals in the 1960s and 1970s were created from the big publishing firms, who then found academics to work with them (for the wider context, see our Untangling Academic Publishing, 2017). Journals created by commercial publishers did indeed seek scholarly respectability by appointing boards of academics to oversee ‘scientific and editorial policy’. But with ownership of the journal resting with the publisher, such boards had little or no involvement in financial policy. That insistence that copyright be retained by authors (or by editorial boards, as representatives of the academic community) is also intriguing in the light of subsequent developments. It is not yet clear quite when publishers of academic journals became so determined to control copyright, but it is a phenomenon of the later twentieth century. The Royal Society changed its policy in 1990 (asking authors to transfer copyright, rather than holding copyright jointly between author and the Society). The Society was unlikely to have been a pioneer in this, but was likely to be reflecting general trends in the publishing industry. Its justification was framed in the light of seeking ‘maximum protection’ from the recent 1988 Copyright Act; owning copyright would give the Society control over ‘secondary rights, such as reprinting, reproduction and electronic document delivery’. This attitude reflected the fact that – in contrast to the 1960s – journal publishing had come to be managed as a potential source of income for the Society, rather than a service to the scholarly community. (Note, the Society has now changed to a licence to publish). In the twenty-first century, we might usefully look again at these 1963 ideas. Their argument about the importance of governance and ownership of academic journals seems timely. So wrote mathematician (and fellow of the Royal Society) Louis Filon, in the summer of 1936. 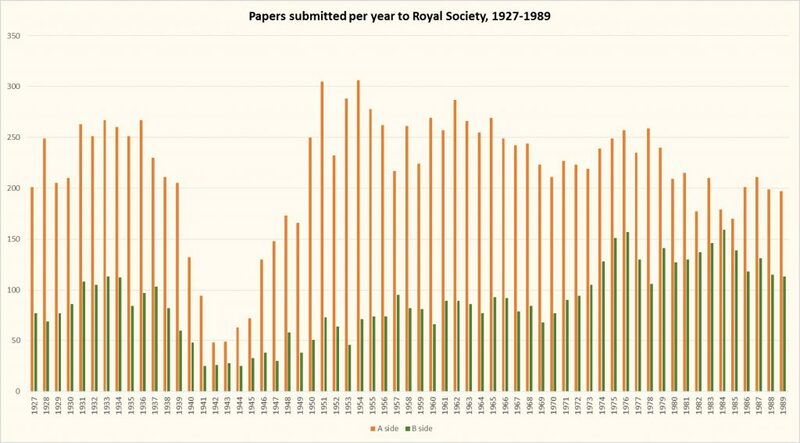 This graph shows the number of papers submitted to the Royal Society over the course of (roughly) the twentieth century. It includes papers that would ultimately be published in both Transactions and Proceedings, as well as papers that were never published. Printing the Society’s publications fell to a relatively small number of printers in the nineteenth and twentieth centuries. The Society tended to stick with a printer for several decades before changing, sometimes in order to get a reduced price, or on some occasions to receive better quality productions; the interplay between cost and quality was never clear cut and was often complicated. It is thus significant that in 1934 the Council of the Society appointed a Publications Committee to enquire into and report on the paper, printing and engraving of the Society’s publications. The Committee’s report was based on considerable research into the production processes and materials used for the Society’s publications by the Committee members. As indicated, this was all based on interviews with printers, paper-merchants, and event visits to the production sites in some cases. The report sent to Council addressed paper quality for text and images; the quality of blocks for printing images; processes used for printing and engraving; types of ink; the quality of wrappers for binding publications; and typographical styles. As well as suggesting that the portraits for obituaries should now be done by the photo-litho-offset process (cheaper than photogravure process), the Committee suggested better quality paper should be used for the Society’s publications, including for printing images, which would cost an extra £150 per annum for text and 20-25% more for images. In fact the Committee were privy to knowledge that there had been complaints (presumably from authors) that the reproduction of images was unsatisfactory. The problem was partly related to bad printing, for which the Society’s printer of 56 years, Harrison and Sons, was responsible. But bad printing blocks were also to blame, as well as poor quality drawings. Yet, Harrisons ‘frankly admitted that some of the printing has been unsatisfactory, and “would assure us that every care will be taken to maintain a high standard of production”’. With Harrisons’ assurance, and a promised 7-8% reduction in costs for the Society, Harrisons were kept on as printer, but the ‘quality of their work’ was to be reviewed a few months later. 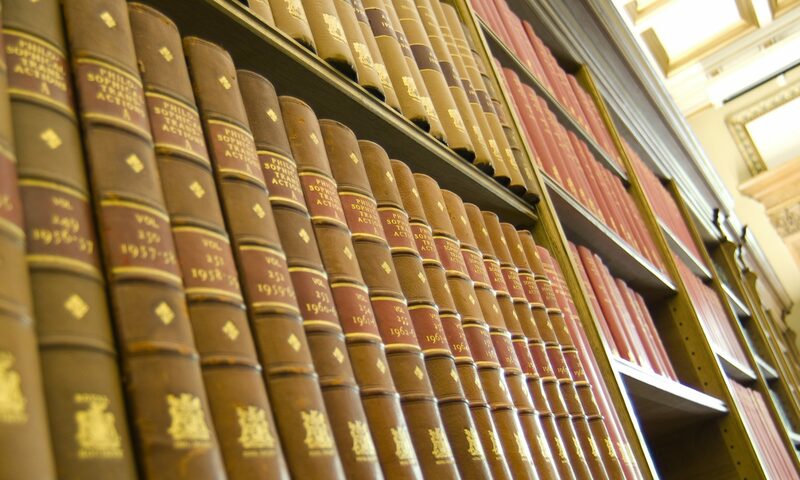 The following year saw a permanent Publications Committee formed to meet annually to discuss and report on the text, paper and printing of publications. The dissatisfaction with Harrisons is perhaps unsurprising when we realize that Harrisons was not particularly skilled in scientific printing. It is known most for the printing of H. M. stamps, and for acting as official printer to a number of government departments [ref to Harrisons biog.]. In this way it contrasted with the Society’s previous printer, Taylor and Francis, which was a major printer-publisher of scientific print throughout much of the nineteenth century. By transferring printing from Taylor to Harrisons in 1877, the Society was compromising quality for the reduced cost that Harrisons, as a much larger printer, could offer. But by 1934, the Society was beginning to question whether the quality of printing offered by Harrisons was sufficient. In fact, despite continued struggles with the rising cost of publishing, the Society adopted the Publications Committee’s somewhat costlier recommendations, showing that quality trumped cost in this case. Even though the Society had stuck with Harrisons for almost sixty years, by 1937, in fact, the Society had moved printing once again, this time to the Cambridge University Press. Cambridge University Press had considerable experience printing scientific books by its University lecturers, and could meet Harrisons costs. 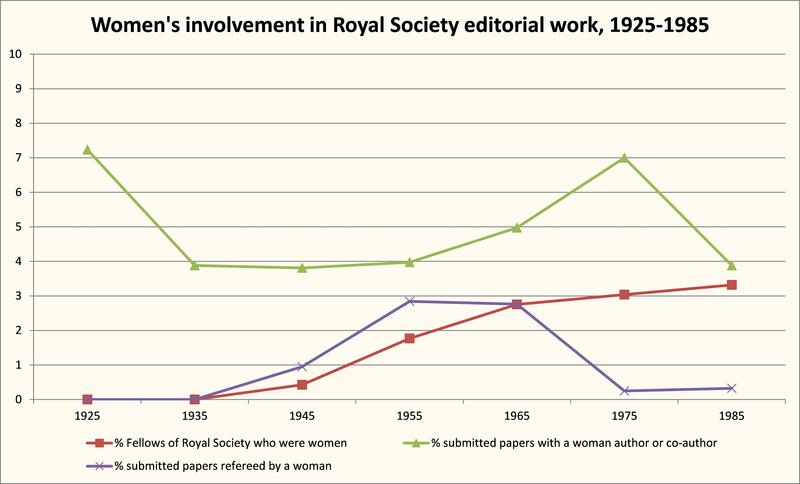 Source: CMP/14, 5 July 1934, p. 151-153, Royal Society Archives, London. 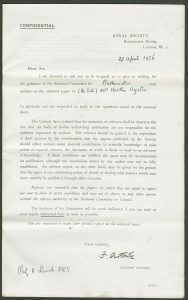 In the 1890s, the Royal Society had introduced a set of 7 questions for referees, in the hope of structuring the reports (which were sometimes extremely long-winded!). These were originally hand-written into the covering letter, but were quickly turned into a printed standardised report form, sent to each referee with the manuscript to be evaluated. Referees were encouraged to return their reports within 14 days – a deadline that was routinely breached. By the early twentieth century, these report forms included clear instructions for referees, including advising them of the confidentiality attached to the papers referred to them (see image). It was routine for the author’s name to be written on the form: refereeing was single-blind, not double-blind. At this time referees were always Fellows of the Society (and their names and reports were kept confidential), but the majority of papers came from those outside the Fellowship. The printed forms were also an attempt to standardize the refereeing process, or to at least advise referees on how to write an effective report. The Society never officially instructed referees until this date; referees were automatically expected to know how to write a report. Guidance on this continued to develop. By 1926, ‘Instructions to Referees’ was part of the Society’s Standing Orders. Source: Box RR, 1925-1926, Royal Society Archives, London. In 1920, the Society was once again anxious about the cost of publishing, and the ongoing deficit in the publishing account. This year it was particularly heightened owing to the aftermath of the war, which meant increases to printing costs and salaries, whilst the income of the Society remained static. As a result, the Council appointed an Emergency Finance Committee. Several Fellows were appointed committee members, including James Jeans, who was current Secretary of the Society (1919-1929). 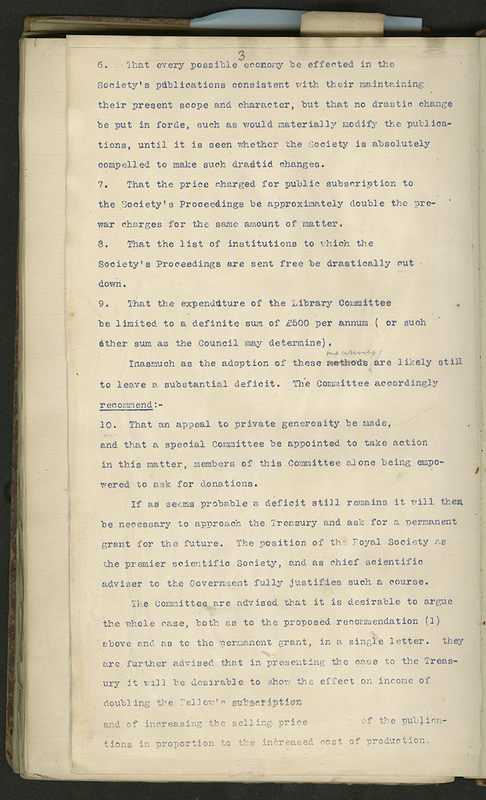 The suggestions to counter the impending deficit on the Society’s general account that were adopted by Council included: transferring unexpended balances from government research grants to the general account; raising Fellows’ annual subscriptions to £5 (from £4); increasing new Fellows’ entrance fees to £20, (from £10; £1 covered by Fee Reduction Fund), £10 of which to be covered by the Society’s Fee Reduction Fund; allowing Fellows to receive A or B of Transactions and Proceedings only (except when approved by Council), rather than both A and B; raising the cost of public subscription to the Society’s publications by 50%; cutting the list of institutions receiving Society publications for free; limiting the expenditure for the Library Committee (for purchasing books); and making ‘an appeal to private generosity’. One of the biggest pressure on the Society’s finances was printing. This was partly owing to the work done on the International Catalogue, and on the Catalogue of Scientific papers – both of which involved collating a record of scientific papers alphabetically [or chronologically? ], and were extremely expensive in terms of printing. Yet, the Society’s journals were also to blame. The Emergency Committee therefore suggested that ‘every possible economy be effected in the Society’s publications consistent with their maintaining their present scope and character’. 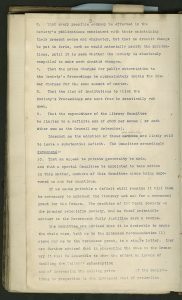 The Society was unwilling to drastically change the Transactions, for instance by imposing strict page limits; this was seen as an unnecessary risk to the purpose and scope of the journal. This episode in the Society’s history is important, not because of the effect these changes had on income – the Society continued to lose money on its publications – but, rather, because it signified a slight change in the Society’s attitude to finances. While the Society had historically relied almost completely on donations and grants in order to cover costs, never paying much attention to its income stream, it was now attempting to increase its income by raising Fellows’ contributions and the sale price of its journals. The results were not enough to propel the Society into an income-generating model, but they were a sign that some at the Royal Society were willing to think more commercially about the Society’s publishing activities. Commercial agendas would not have any great effect on the Society’s finances until much later in the twentieth century. Source: CMB/86b Emergency Finance report, 20 July 1920, Royal Society Archives, London.